Be the first to share your favorite memory, photo or story of Miriam. This memorial page is dedicated for family, friends and future generations to celebrate the life of their loved one. 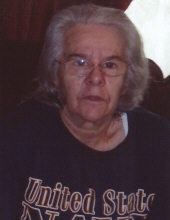 Miriam D. Witt, age 76, of Sullivan, Missouri, passed away Saturday, January 26, 2019 at Meramec Nursing Center in Sullivan. Miriam Delores was born on November 11, 1942 in Great Falls, Montana, to the late Leauard Enthony and Margaritte Oriet. She grew up in Prescott, Arizona and met her husband, Charles, while he was in the United States Navy. Three sons were born to their union, Charles, Martin, and Travis. After Charles’ discharge from the Navy, the Witt’s made their way to Sullivan. Miriam worked at the Midwest Shoe and then Wal-Mart for several years. She liked flower gardening and taking care of her house plants. Together, Miriam and Charles enjoyed taking their camping trailer to local campgrounds and would sometimes stay out in it for a couple weeks at a time. They also enjoyed playing cards and Farkle, at the time when they learned how to play the dice game, it had yet to be named. Miriam loved her family and spending time with her grandchildren. She will be lovingly remembered and missed by her family and friends. Miriam is survived by three sons, Charles Witt and wife, Nancy, of Columbia, MO, Martin Witt of Sullivan, and Travis Witt and wife, Amy, of Moberly, MO; five grandchildren, Brandon Lehman, Patrick Witt, Autumn Witt, Kirstie Witt, and Travis Witt; one brother, Joseph Eugene Oriet of McPherson, KS; one sister, Zita Mae Morgan (Oriet) of the state of Washington; nieces & nephews, other relatives and friends. She was preceded in death by her husband, Charles P. Witt; her parents, Leauard Enthony and Margaritte (Lynch) Oriet; five siblings, Leauard Anthony Oriet, Jr., Vincent Leon Oriet, Marguerite de Chantal Licklitter (Oriet), Clarence James Oriet, and Martin Louis Oriet; and one granddaughter, Mariska Witt. Funeral services will be conducted 1:00 PM, Saturday, February 2, 2019 at the Eaton Funeral Home in Sullivan, with Pastor Adam Duncan officiating. Interment will follow in I.O.O.F. Memorial Cemetery in Sullivan. Visitation will be held from 12:00 PM to 1:00 PM, Saturday, at the Eaton Funeral Home in Sullivan. Friends may send online condolences to the family of Mrs. Witt at www.eatonfuneralhome.com. To send flowers or a remembrance gift to the family of Miriam D. Witt, please visit our Tribute Store. "Email Address" would like to share the life celebration of Miriam D. Witt. Click on the "link" to go to share a favorite memory or leave a condolence message for the family.